One of the most important requirements for fired equipment in the modern world is related to the emission of gases that are not environmentally friendly. 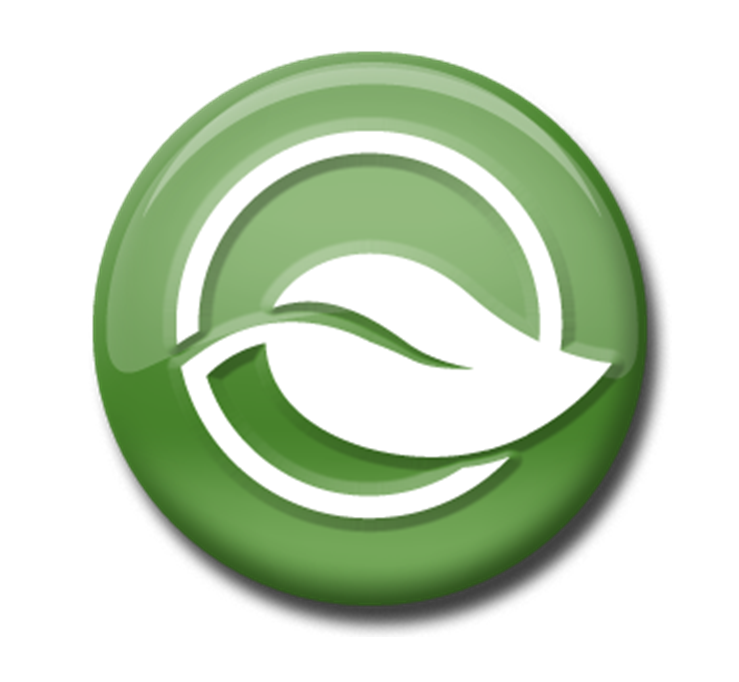 Halgo Power offers a variety of products to meet the emissions criteria specified by the environmental authorities, including NOx catalysts to control Nitrogen Oxide emissions through Selective Catalytic Reduction (SCR), CO Catalysts to control Carbon Monoxide emissions, and the supplementary Ammonia and/or Urea equipment that support such systems. The Carbon Monoxide (CO) Catalyst typically consists of a grid of metallic oxidation catalysts that allow flue gas to flow through and contact the catalyst material, reducing the carbon monoxide content in the process. Each CO Catalyst arrangement is custom designed for the project at hand, and the final length, width, height, and element density selected depend heavily on project specific parameters. CO Catalysts are most commonly placed in the flue gas path between the boiler and the economizer. A NOx Catalyst uses anhydrous or aqueous ammonia in combination with catalyst materials (Titanium Dioxide (TiO2), Vanadium Oxide (V2O5), and Tungsten Trioxide (WO3)), to transform Nitrogen Oxides (NOx) in the flue gas into diatomic nitrogen (N2) and water. Each NOx Catalyst arrangement is custom designed for the project at hand, and the final length, width, height, and element density selected depend heavily on project specific parameters. NOx Catalysts are most commonly placed in the flue gas path between the boiler and the economizer with supporting ammonia process equipment situated nearby. Ammonia Unloading Stations are pump stations that are designed to unload Aqueous Ammonia from a transport vessel into storage tanks or a forwarding system. They typically include a control system, panel interface, and features to promote safe handling and transfer of the liquid to its destination. 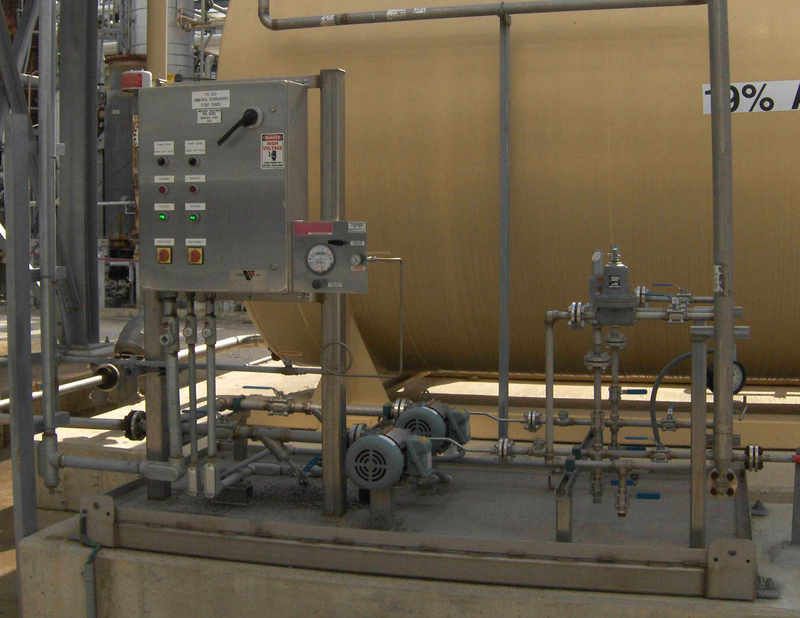 The ammonia unloading station is custom engineered and sized uniquely for each project to deliver the required fluid volumetric flow rate and pressure. 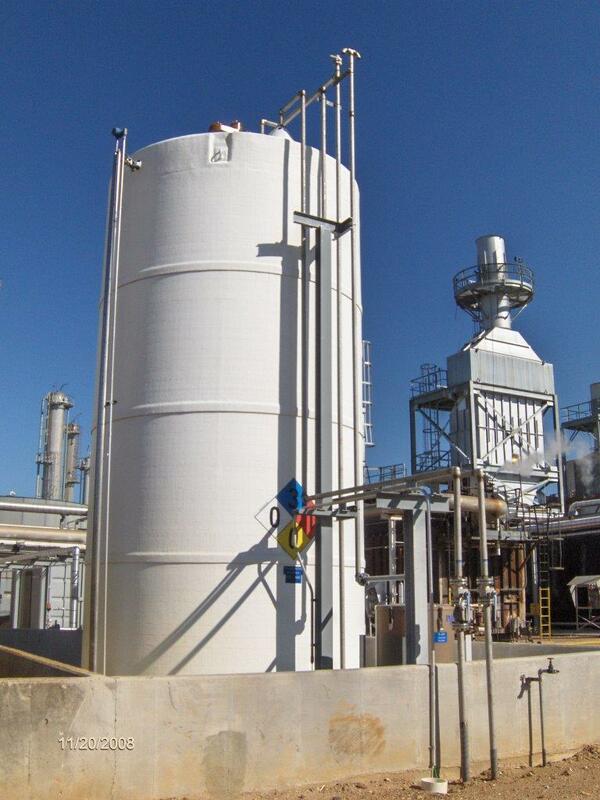 Ammonia Storage Tanks are sometimes required on a package boiler when a Selective Catalytic Reduction (SCR) system is included. The ammonia is required in the catalyst process that converts Nitrogen Oxides (NOx) into diatomic nitrogen (N2) and water. A tank serves as the storage location for ammonia feedstock when an existing supply of the material is not readily available on site. 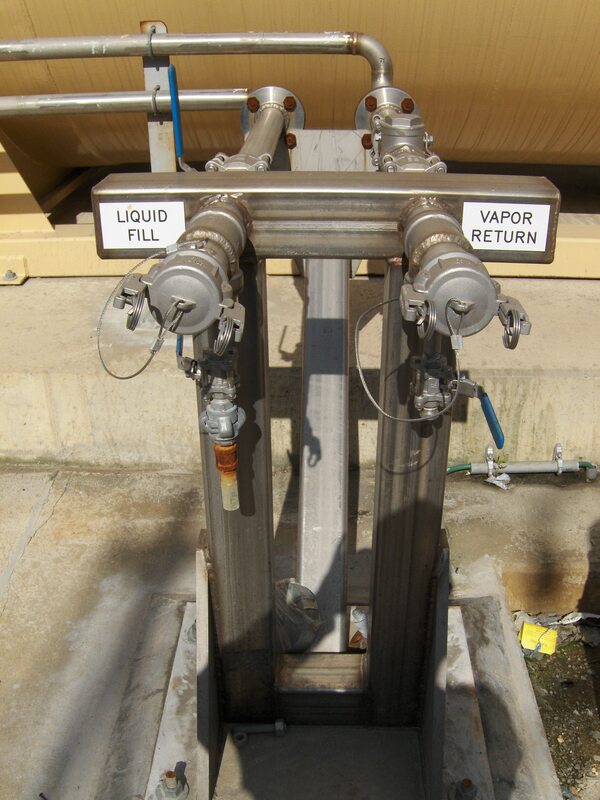 Lined or unlined holding tanks are offered to store the chemicals until needed, and the tanks are typically filled by an unloading station. They act as a storage location until drawn from by an Ammonia Forwarding Station. 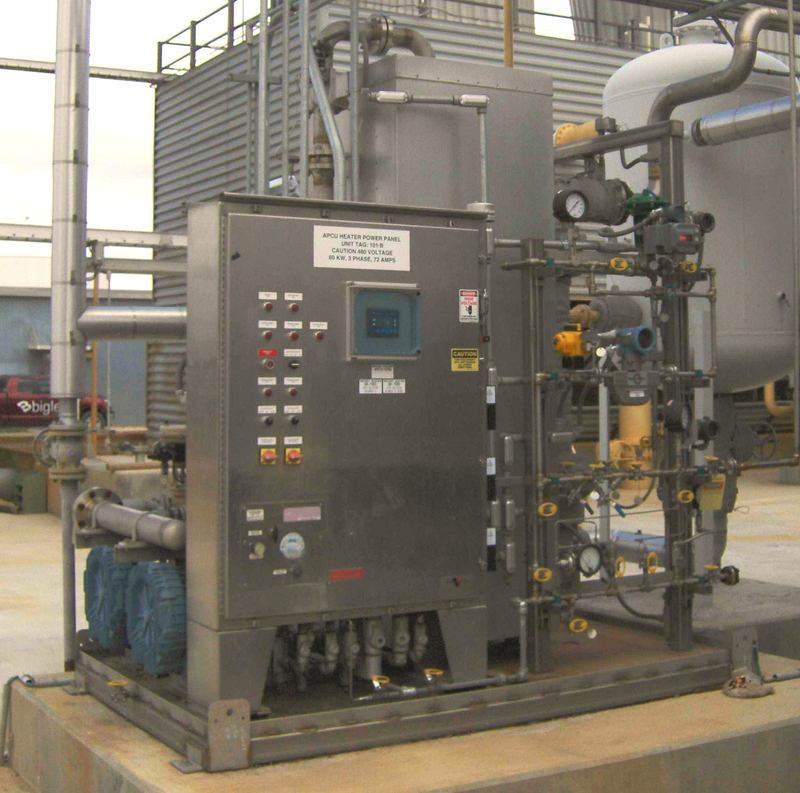 An Ammonia Forwarding Station transfers and pressurizes Aqueous Ammonia from a storage tank or vessel to an Ammonia Flow Control Unit (AFCU). The system includes controls, a panel interface, and all necessary features to guarantee safe, efficient, and reliable operation. Each Ammonia Forwarding Station is custom engineered for the project at hand and is tailored to the specified flow and pressure requirements. An Ammonia Flow Control Unit regulates the flow of ammonia from the Ammonia Forwarding Station or Ammonia Storage Tank to the Ammonia Injection Grid that is situated in the flue gas path. The system includes a vaporizer that absorbs heat from an electric heater, low pressure steam, or flue gas. Controls and a panel interface are engineered with each flow control system and include all of the necessary features for safe, efficient, and reliable operation. An Ammonia Distribution Manifold is a piping system that evenly splits the centralized flow of ammonia from the Ammonia Flow Control Unit to multiple smaller outlets that connect to the Ammonia Injection Grid. A balanced flow of ammonia to each lance assembly in the injection grid is essential to ensure that NOx catalysis occurs as expected, therefore, each solution is custom engineered for the application at hand. The Ammonia Injection Grid receives aqueous or anhydrous ammonia from the Ammonia Forwarding Station and evenly disperses it into the flue gas stream. Through a series of lances and nozzles, the pressurized ammonia is atomized and injected into the ductwork between the boiler and the Selective Catalytic Reduction (SCR) unit. 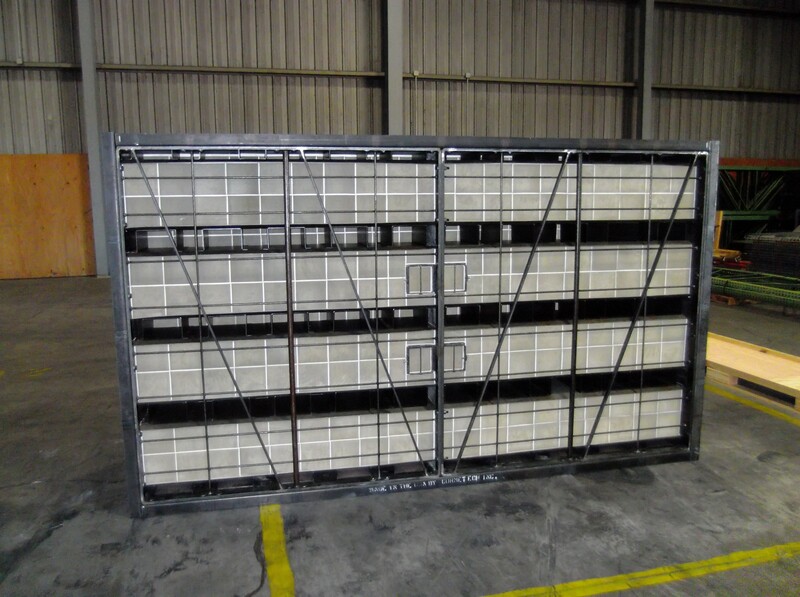 The injection grid is custom engineered for each project to effectively and efficiently distribute ammonia in a way that allows the catalyst process to reduce Nitrogen Oxide (NOx) emissions.